Revenge was one of the first games made by version 1.0 of ANGELINA, for a 2011 paper Multi-Faceted Evolution of Simple Arcade Games. 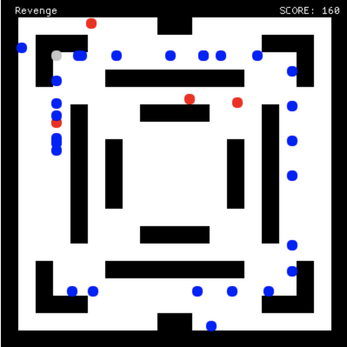 You move a grey dot with the arrow keys, and gain points when you touch blue dots. You lose if you touch one of the teleporting red dots.